Around half of the printed books you see in bookstores simply don't get sold and end up going back to their publishers to get pulped. That seems an awful waste of time, effort and paper. Today's new technology means that it's now much, much easier (and cheaper) to read books electronically - or to just have the book printed when someone wants to buy it (via print-on-demand) with a few clicks online. You can download an eBook in seconds and have a print-on-demand book arrive in your letterbox within days. That's smart and eco-friendly. So my books are available ONLY as e-books (just $3 NZ) or as a print-on-demand paperback (for around $18 NZ) online. NO WAY BACK - As a teenager, in one tragic and fateful night on Auckland’s Waitemata Harbour, Adam Holt’s carefree world is changed forever. Twenty years later, having continually struggled to get his life back on course, everything suddenly falls apart again. First his best friend is murdered, stabbed to death in a seemingly random home invasion, and then his teenage son mysteriously disappears. And Adam’s problems only escalate when an unstable and dangerous man begins furiously stalking him. Desperately wishing he could turn back time, Adam is forced to try and unlock the secrets of a past that haunts him – or he may never find his way out of this mess. MOVING ON - Nick Davis just wants to make it home from work in time for dinner - but instead his life is forever turned inside out after a horrific car accident. He awakens in hospital alone, confused and trapped inside the body of an eight year old boy he does not know. Initially believing he's in a coma-induced dream Nick tries to play along, morbidly fascinated by his apparent resurrection and the strangely familiar reality-world around him. But quickly things turn from bad to worse as he comes to realise that years have passed him by, his families' lives are being threatened, and that - for him - the afterlife has taken on new meaning. 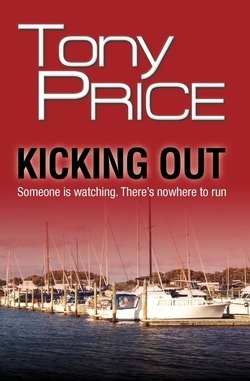 KICKING OUT - For 20 year old Lily MacDonald, aside from the death of her mother when she was only a child, growing up in the small town of Hawthorne, New Zealand has been relatively idyllic - until the day her safe and carefree world is torn apart by the detonation of a bomb in her work-place. Friends and colleagues perish and Lily's life begins to spiral out of control as she fears that a psychopath is targeting her. Her initial terror quickly turns to desperation when events become darker and more bizarre as Lily is also forced to battle with a psychic gift awakening inside her.